Financing & Extended Warranties Available! Coachmen Crossfit & Coachmen Galleria as Seen on The Fit RV! Check Out What They Found! 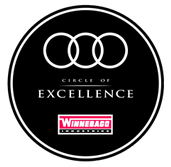 2018 Winnebago Circle of Excellence Award Winner!